Thermal, Calif. – As Competent Motorsport continues its celebration of the organization’s 10th year, the Pirelli GT3 Cup Trophy USA championship embarks on a new circuit this weekend at The Thermal Club, about 30 miles outside of Palm Springs, California. The private motorsports venue is a relatively new one having held is first official race event in 2014. Designed by Alan Wilson, the track has 4.5-miles of asphalt with the flexibility to run 20 different configurations. This weekend, the Pirelli GT3 Cup Trophy USA will utilize the ‘Two Palms’ circuit which features 3.1-miles of racetrack with 18 unique corners. The 2016 Pirelli GT3 Cup Trophy USA championship kicked off one month ago with some strong competition among its four different racing divisions with each class – Diamond, Platinum, Platinum Masters, and Silver – putting on quite a show through two races of all green flag running. A similar showing is expected for this weekend’s event at The Thermal Club. Robert Todd leads the Diamond class championship following the first round of competition after he swept both races at Circuit of the Americas. John Krieg holds the Platinum class championship lead after the Circuit of the Americas event in which he won Race 1 and placed fifth in Race 2. He’s particularly looking forward to this weekend’s event at The Thermal Club as it’s a circuit in which he already has experience. Youngster Sean McAllister impressed in his first-ever car races at Circuit of the Americas with his double podium finish that sees him atop the championship standings in the Silver class, which features the Porsche Cayman GT4 ClubSport. New for The Thermal Club weekend will be the introduction of the Silver Masters class. Larry Schnur leads the way in the Platinum Masters championship after a solid run at Circuit of the Americas. The Thermal Club event weekend kicks off on Friday, April 8 with three practice sessions followed by two days of racing on Saturday and Sunday. 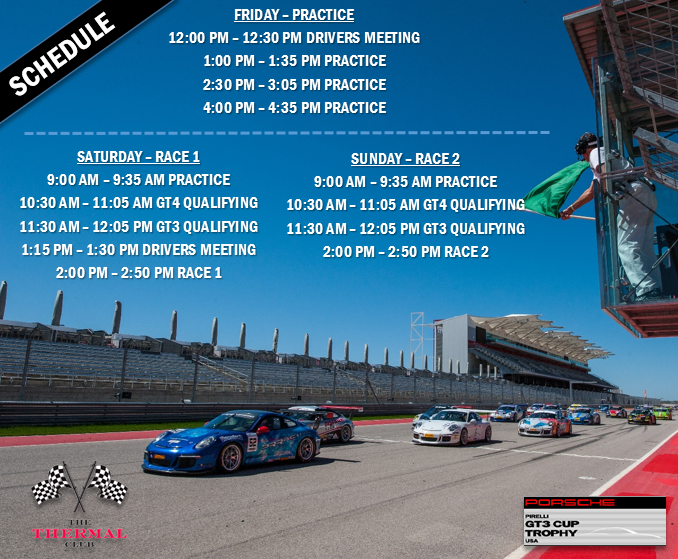 Live timing and scoring can be followed throughout the weekend at: http://www.competentmotorsport.com/live-timing/. The 2016 Pirelli GT3 Cup Trophy USA championship will be staged with support from series partners Porsche Motorsport North America, Pirelli Tires, BRM Chronographs, Discount Tire, Mothers, BBS, MoTec, Pagid, RSS, and Stand 21.